Glasgow Caledonian University’s £5.6 million New York campus still has no degree students two years after its launch. The University’s application to the New York authorities for a licence to teach and award degrees has not been approved yet, according to BBC reports. Labour referred to the campus was “a very expensive white elephant”. University bosses insisted it would eventually repay the investment. University chancellor Mohammad Yunus launched GCU NY in September 2013 when a 15-year lease on premises was agreed. That might have made it possible for teaching to start in autumn 2014 but courses have not gone ahead because the university is still waiting for a licence. The university’s deputy vice-chancellor, Professor James Miller, told the BBC he was “confident” degree-awarding status would be granted by New York State. “We’ve been told that as far as they’re concerned there are no particular issues with our application,” he said. In a statement, the New York state education department said it had several pending requests and “there is no established timeline for the completion of the review and consideration of those applications”. A spokeswoman for the university added: “It is highly disappointing that rather than directly engaging with us to discuss our GCU New York venture, the first route chosen by Jackie Baillie MSP has been to secure media coverage to flag her concerns. 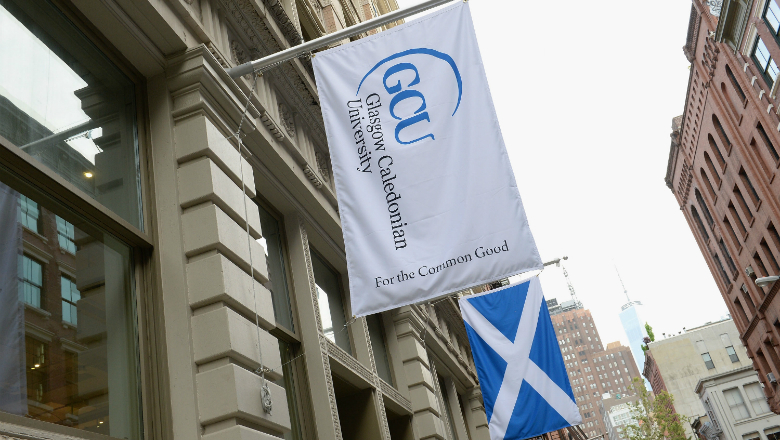 GCU is the first University in the UK to open a campus in New York.